A central tool of seismology is the calculation of synthetic seismograms that can be compared with observations. 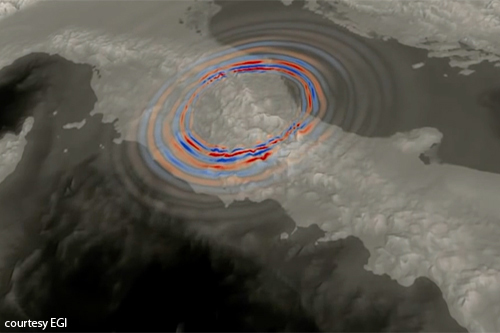 The only way to generate ‘realistic’ synthetic seismograms for complex three­dimensional models is by means of numerical methods, implemented on supercomputer hardware. TIDES participants have been leading this field in Europe and beyond for several years and numerous algorithms that solve the wave propagation problem on reservoirs, regional and global scales, are available and implemented on supercomputers. One of the most important points and the central motivation for TIDES is the fact that only now computational power has reached a point where many such “forward calculations” (i.e., simulations of wave propagation) can be done making it feasible to perform the imaging by trying to fit complete waveforms (rather than travel times).